Quick turnaround this week, so I can only put together an abbreviated preview. Deal with it? Arsenal are through to the fifth round of the FA Cup where they will have their annual cup tie with Hull, so that's nice. But, the fixture congestion ramps up as we get February underway and Arsenal are sitting third in the Premier League. They haven't won a league game in exactly one month and they'll be facing a mid-table Southampton side that gave them their worst loss in two years back on Boxing Day. The Saints have won three straight in the league to climb up to 8th. If Arsenal don't get back to winning ways soon, they're going to find themselves out of the most open title race in years pretty quick and that would be a massive disappointment. There's bad news again for Tomas Rosicky as the Czech international picked up a thigh injury in his cameo on Saturday which will see him out for another six weeks. Elsewhere, Jack Wilshere has reportedly suffered a setback, but Arsene Wenger has denied that. Wenger has said it'll be four weeks before Jack's return. Danny Welbeck is back in full training but lacks match fitness; he'll need a run-out or two for the Under-21 side before he gets back into the first team. Per Mertesacker will return from his one match suspension. Predicted XI: Cech, Bellerin, Mertesacker, Koscielny, Monreal, Flamini, Ramsey, Campbell, Ozil, Alexis, Giroud. At the forward position, Jay Rodriguez remains out with a foot injury and Graziano Pelle is a 50/50 doubt with a knee problem. It could mean a start for Charlie Austin, purchased this transfer window from Queens Park Rangers. Austin has made an immediate impact with the Saints, scoring the winner at Old Trafford last weekend. Predicted XI: Forster, Soares, Fonte, van Dijk, Bertrand, Wanyama, Clasie, Targett, Mane, Tadic, Austin. While some may think that Arsenal's progression in the FA Cup could spell problems for their league title bid (thanks to fixture congestion,) I argued last weekend that a loss or draw to Burnley would have psychologically been worse for the Gunners. That's because, as I noted in the intro, Arsenal have not won a league game in a month. After the win over Newcastle and victory over Sunderland in the FA Cup, Arsenal have drawn 3-3 with Liverpool, drawn 0-0 with Stoke, and lost 1-0 to Chelsea. Regardless of what the fixture congestion might end up looking like in spring, it's hard to imagine Arsenal coming into this match with confidence if they had pushed that winless streak across all competitions to four. As it stands, Arsenal are still okay: they're into the last 16 of both the FA Cup and the Champions League (for now,) and they are still within striking distance of first place in the Premier League with 15 matches to play. As for Southampton, they have been massively inconsistent all year. Their 4-0 win over Arsenal on Boxing Day was the club's only win over a 10 match span, from November 21 to January 9, when they were eliminated from the FA Cup by Crystal Palace. Now, with just the league to focus on, the Saints have won three on the bounce, and they've kept clean sheets in all of them: 2-0 over Watford, 3-0 over West Brom, and most importantly, 1-0 over Manchester United at Old Trafford. Their elimination in the cup means this is their first game in 10 days, while it's Arsenal's second game in four. 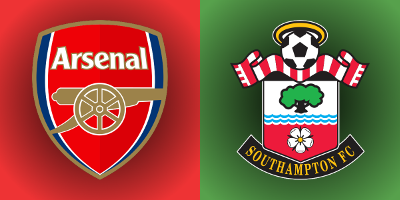 Arsenal have struggled against Southampton in the past couple of seasons, though the Saints have not won at Arsenal in the league since November 21, 1987. Earlier this season, Southampton pummeled Arsenal 4-0 at St. Mary's on Boxing Day. Cuco Martina scored the prettiest goal he'll probably ever score in his life to give the home side a 1-0 lead on 19 minutes before Shane Long took over in the second half. Long scored Southampton's second, arguably fouling Laurent Koscielny in the build-up, but Jose Fonte's free header from a corner on 69 minutes put the match to rest. Shane Long added a fourth in the 94th minute just to really throw salt in the wound. Arsenal did win this fixture last season by a 1-0 scoreline, with Alexis Sanchez finally putting in the winning goal on 89 minutes. Arsenal had controlled the match, but Fraser Forster made seven saves. Arsenal have won all three league meetings with Southampton at the Emirates since the Saints won promotion in 2012, though Southampton did win 2-1 in the third round of the League Cup last season. Southampton, on the other hand, have two losses from two matches with Mason in the middle this season, losing 1-0 to Stoke in November and 2-1 to Crystal Palace in the third round of the FA Cup a month ago. Both of those Southampton losses came at St. Mary's. Dating back to last year, Southampton have lost three straight with Mason in the middle; their last win with Mason as the referee was over Stoke in last year's League Cup, 3-2 at the Britannia. John Painting is a contributing writer to the Modern Gooner and made all the pictures disappear. You can follow him on Twitter @zorrocat to vehemently complain.